It’s estimated to cost between £45,000 and £50,000, minus any government subsidy, when order books open in early 2012, but Volvo is only going to produce 1000 in the first year. Production won’t commence until November 2012 and will increase to around 5,000 cars in 2014. The biggest market for the car will be Scandinavia, but the UK will get a share of between 5-15% of total production. 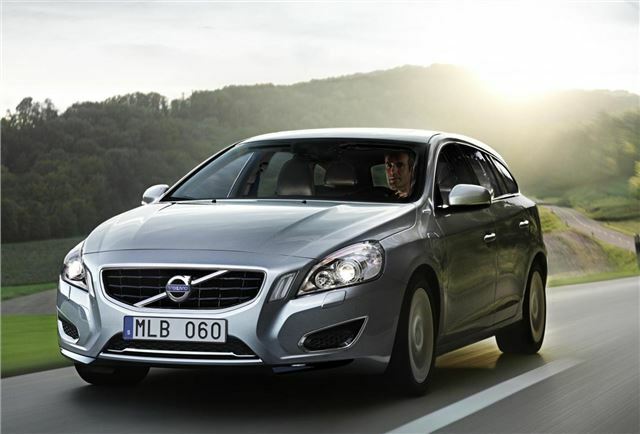 Volvo expects 80% of V60 Plug-in Hybrids to be used as company cars. The powertrain consists of a 215bhp five-cylinder D5 diesel engine connected to a 70bhp Li-ion battery linked to a six speed automatic gearbox. The car can run on pure electric for up to 31 miles and can be charged in 3.5 hours, so on most short journeys it can run without using any fuel. Performance is good – 0-62mph takes a brisk 6.2 seconds, and yet CO2 emissions are just 49g/km, and the official combined cycle fuel economy figure is an astounding 148.6mpg. Power from the diesel engine is sent to the front wheels while the electric motor powers the rear. There are three drive modes; Pure, Hybrid and Power. In Pure mode the car runs on the electric motor alone wherever possible. Hybrid mode is the ‘normal’ setting, in which the diesel and electric motor cooperate to provide the best balance of performance and economy, and Power mode does what you’d expect, offering the best possible performance by combining both the electric motor and diesel engine. Drivers can also choose AWD mode to provide better traction in slippery conditions, and they can save battery power for later - so, for example, they can drive the car in Pure mode when they reach a city centre with tight emissions regulation. The V60 Plug-in Hybrid will be offered in one shade of silver and one trim level – Pure Limited, which is based on the range-topping SE Lux. The interior features black leather upholstery with contrasting stitching and blue-grey wood inlays, and standard equipment includes Bluetooth, parking sensors and an electrically adjusted driver’s seat, as well as a seven inch multimedia screen.